AMOLF researchers have developed nanoscale strings whose motion can be converted to light signals with unprecedented strength. This could allow for extremely precise sensors and comes with an important side effect. "Analogous to a guitar amplifier in overdrive producing distorted sound waves, our strong motion-to-light conversion leads to distorted light signals," says group leader Ewold Verhagen. "But these signals actually carry information about the motion that may lead to new ways of measuring quantum mechanical motion." The researchers published their results on 7 July 2017 in Nature Communications. When a guitar player turns up the volume of the amplifier to the highest gain levels, the 'clean' harmonic vibrations of the guitar strings are converted to distorted sound waves. This 'dirty' sound is often desirable—the screaming of overdriven guitar amplifiers has defined the sound of rock music for decades. The Photonic Forces group at AMOLF studies the interaction of motion and light using nanoscale silicon strings that vibrate like guitar strings at millions of times per second. 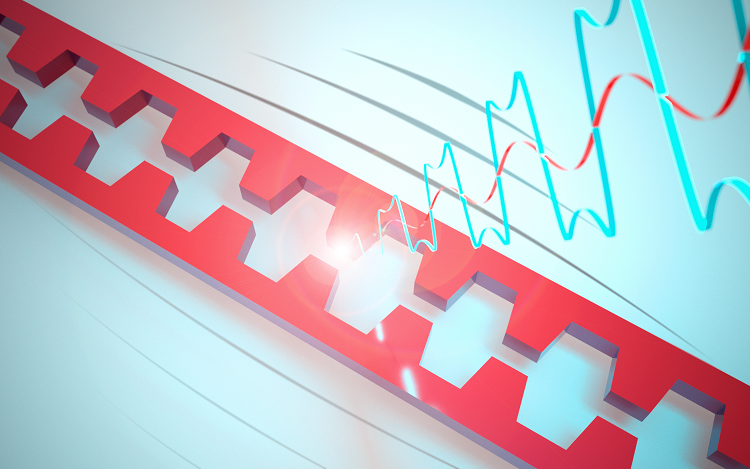 The researchers use light to measure these vibrations with extreme precision. PhD student Rick Leijssen and his colleagues developed strings with a particular shape to squeeze light between the strings at a scale of tens of nanometers. "The tight confinement causes mechanical motion to be converted to light signals with unprecedented strength. This is a big step forward to creating motion sensors with extreme precision," Leijssen says. "Such sensors could detect string vibrations with amplitudes as small as the size of a proton and could be used to measure small forces and masses." The strong conversion of motion into light in the silicon strings has a side effect: The conversion is so strong that even for the tiny intrinsic fluctuations of the strings, the light is 'overdriven,' analogous to what happens in rock guitar amplifiers. Verhagen says, "Similar to the screaming sound of an overdriven amplifier, the light signals in our experiment contain many higher harmonics ('overtones') of the fundamental string resonance. This is because the conversion between motion and light is no longer linear." In a way, this nonlinear conversion forms a practical limit to the motion sensitivity. However, the distorted light signals could be put to new use. 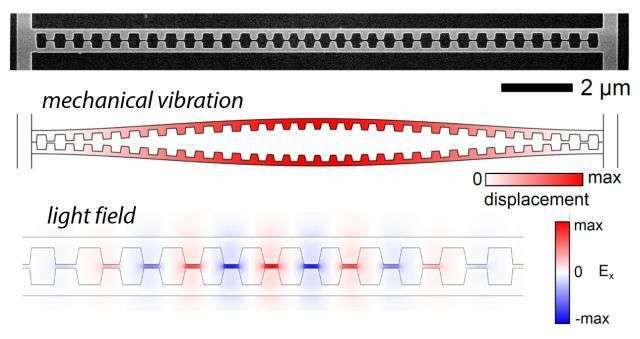 An important reason why the AMOLF physicists study tiny string vibrations is to reveal whether objects like strings behave according to the laws of quantum mechanics. Postdoctoral researcher Juha Muhonen says, "The higher harmonics of the produced light signals carry different kinds of information about the nanostring motion. For example, we demonstrated that they allow measuring the energy of the vibration with a high accuracy. This could potentially lead to direct observations of quantized energy in the string, as we would expect from the theory of quantum mechanics." Can energy be extracted from a proton beam using a current transformer? Quantum thermometer or optical refrigerator?